Clean. Crisp. Sharp. Those are words that come to mind when I think of contemporary art in Oslo. Most of the galleries have a presence in the art fairs and Norwegian galleries and publications were given special attention at The Armory Show (2012) and the Printed Matter Art Book Fair (2014) both in New York. This exposure in the US has been beneficial in further procuring interest. Galleries like Standard (Oslo), the most commercially recognized from this circle, are now also joined by VI, VII a hip and smart gallery run by American transplant Esperanza Rosales and participates in art fairs such as Frieze London, Miart in Milan, Fiac Paris and others. It is through this exposure that many of the art in their inventory is acquired and contacts are made. 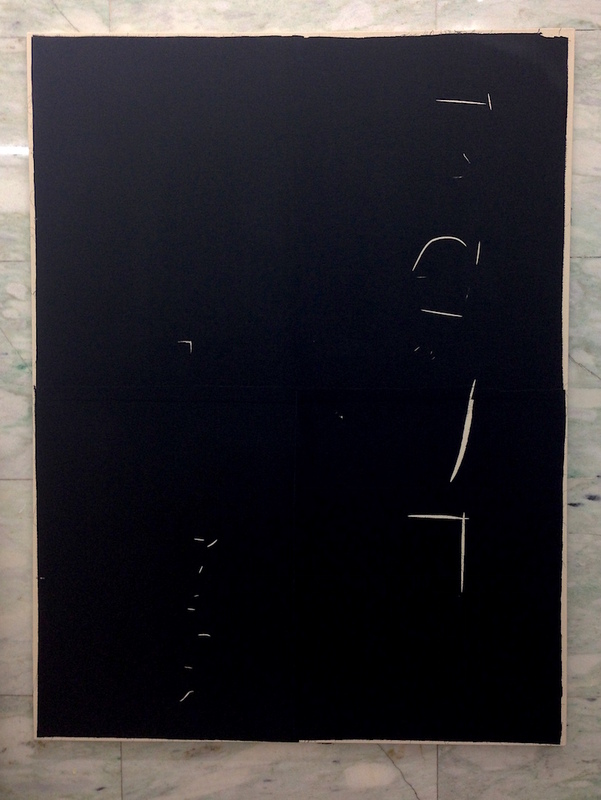 Currently on view at VI, VII is To the Editor, Dear Sir by Brad Grievson a series of minimally cut black fabric mounted on canvas. One of the most important institutions in Oslo is the Office of Contemporary Art (OCA) which has helped to facilitate, promote and organize exhibitions and residencies for Norwegian artists and international artists who are based in Oslo. They have played an extensive role in the selection of artists who participate in the Nordic Pavilion at the Venice Biennial, support the respective projects, by assisting in development and marketing. At present, OCA are working with the American, Oslo based artist Camille Norment who will be solely representing Norway with a performative installation yet to be fully disclosed (hint: Camille Norment Trio will perform!). Another unique space that functions in a multidisciplinary way is Unge Kunstneres Samfund (UKS). Founded in 1921, UKS is a gallery but also provides the option for artist membership working for the “economical and social rights of artists.” Membership can lead to stipend funding in the form of grants, travel expenses, residency opportunities and assistance with occupational demands such as technicalities dealing with galleries, etc. For a city with 634,000 people (2014), the organizations that are set-up receive support from the government and are very proactive in working to bring further attention to contemporary art Norway and help diversify the existent audience. 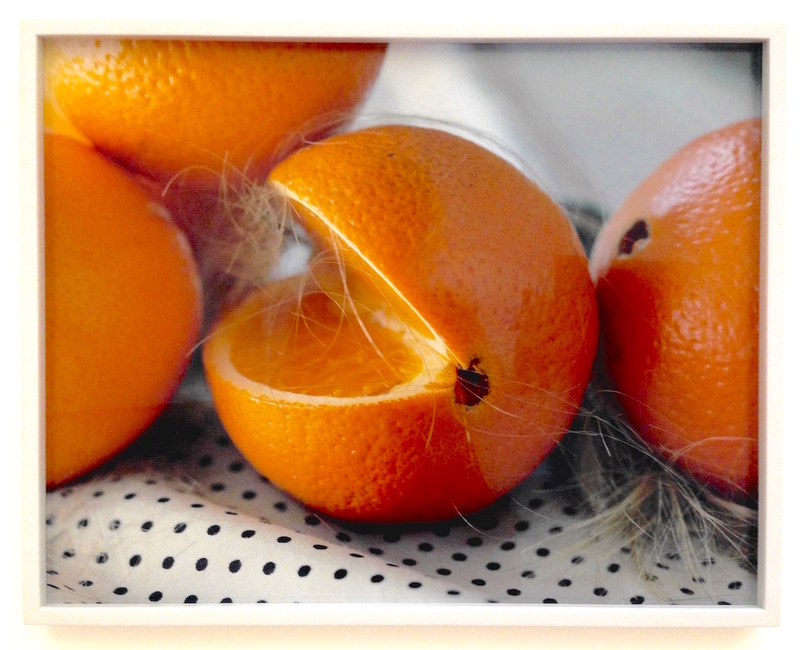 On view in their project space until February 15th, 2015 is “Dear Darkling” by Lene Baadsvig Ørmen. 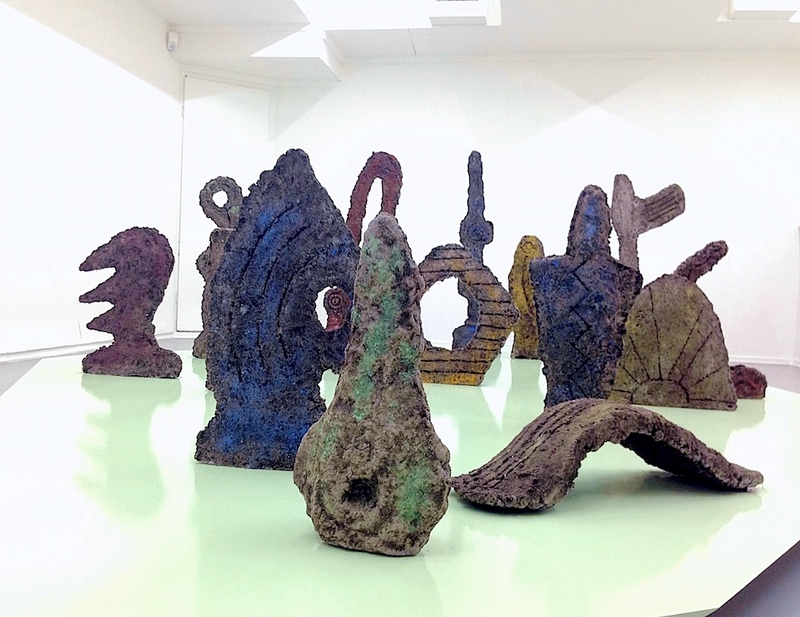 Her sculptures on view are made of cement and submerged in pigment tinted earth. The undecipherable, abstract forms appear to be relics from an unknown time, or symbols communicating in a language yet to be voiced. Beyond the above mentioned venues, there are museums that broaden the contemporary dialogue including Henie Onstad Kunstsenter (HOK) founded in 1968. It houses a permanent collection once owned by ice skater Sonja Henie and Niels Onstad and hosts temporary exhibitions by artists such as the current photographer with work on view Torbjørn Rødland. Titled Sasquatch Century, it offers a comprehensive survey covering twenty years of Rødland’s figurative and object based images. Norway’s answer to Wolfgang Tillmans, his photographs at times present situations that are out of the ordinary, subtle and oddly creepy. Other artists of note who have shown at HOK include, Yoko Ono, Thurston Moore, and Marlene Dumas. They also currently the largest selection of works by Kurt Schwitters (1887-1948) outside of Germany, from the permanent collection and a recent acquisition by the Sparebankstiftelsen DNB (DNB Savings Bank Foundation). Schwitters spent time in Norway first in 1930, then returned annually from 1932-1939. The artwork in the exhibition documents his time in the town Hjertøya including a reconstruction of the entrance to a cottage where he lived, the original is part of an ambitious conservation project. An upcoming exhibition in 2015 will feature work from the Christian Bjelland Collection by Leonard Rickhard and Bjarne Melgaard. Also, installed outside on the grounds of the museum is a sound installation by Camille Norment. The work titled Within the Toll from 2011, finds Norment using the glass harmonica which sonically whispers to the air, inviting those to lean in, pause and to what could be the vocalizations of mythical sirens, enveloping the nearby parking lot. 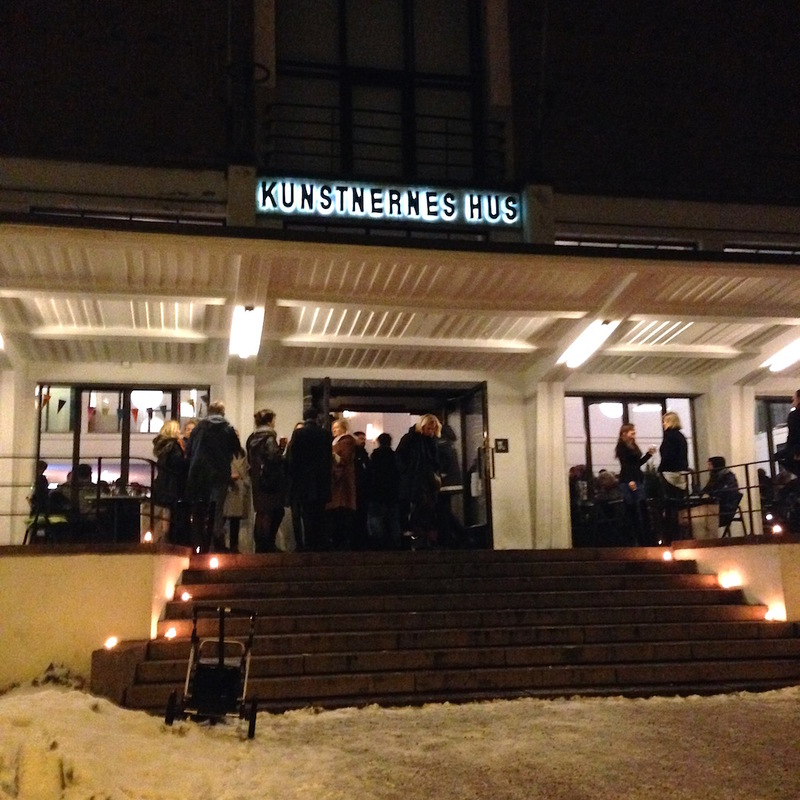 Similarly focusing on a mix 21st Century and 20th Century artwork, the Kunstnernes Hus, centrally located, is the spot to be, especially when they are having an opening. The recently opened Krigens skygge. Politisk kunst i Norge 1914-2014 covers the stretch of political art in Norway with a focus on the last hundred years. The exhibition is diverse in media and the topical resonance, but some pieces are quite strong and on opening night, crowds spilled from the galleries, to the café below. 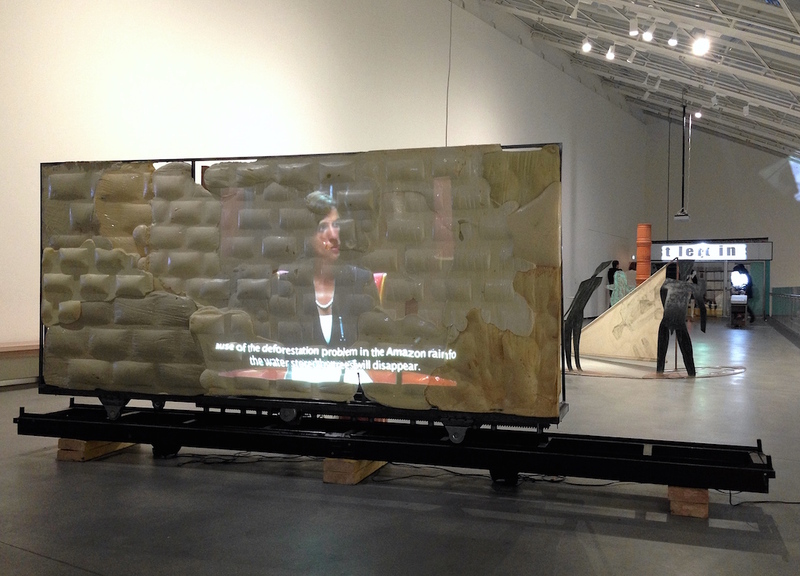 An international group of artists, the political gesture ranges from World War II to immigration. Lastly, located in Aker Brygge, Astrup Fearnley Museet is a private museum with a focus on international art. 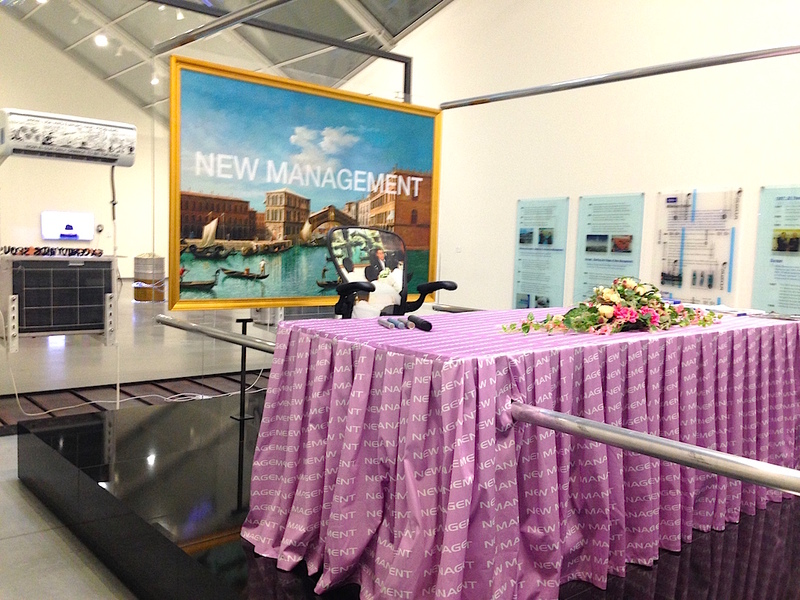 It opened its doors to the public in 1993 and relocated to a Renzo Piano designed building in 2012. Their exhibition roster ranges from artists such as New York superstars Nate Lowman and Dan Colen to Scandinavian duo Elgreen & Dragset and opening February 12th is NN-A NN-A NN-A – New Norwegian Abstraction. Recently on view was Europe, Europe, curated by Hans Ulrich Obrist, Thomas Boutoux and Gunnar B. Kvaran, this exhibition focused on young European artists who are really making their mark in the European (and in some cases global) art scene. Artists included in the exhibition included of particular interest included Camille Henrot (Paris, b. 1978), Joakim Martinussen (Tromsø, b. 1984), Neil Beloufa (Paris, b. 1985) and Helen Marten (Macclesfield, b. 1985) who was also included in the 55th Biennale di Venezia curated by Massimiliano Gioni (2013). The exhibition functioned as a timestamp, diligently making a gestural and accurate notation of what is currently happening in contemporary art, specifically with artists born between 1977-1987. The art was alive. It spoke, it inhaled and exhaled, it moved and if not, made you the viewer move. The Internet was ever-present and how it relates to the physicality of the human body. Within the inherent movement was also a reminder of stillness, the mnemonic cues that through the screen —virutally— we are able to travel, feel, shop, communicate and live. The work begged us to reconsider our positions. It took us through the flatness into the fullness, the dimensionality of proposed space. Each artwork was self-conscious but delightfully so, negating the white cube by presenting kinesthetic situations and possibilities. The city of Oslo has a performance record for conservation. Whether conserving and facilitating the attention given to contemporary art or the art and objects of the past (viking ships! ), the city holds tight to an energy that is warm in frigid temperatures and glows during times of early darkness.